This tea strainer has a simple, but elegant design and works very well. A very good quality item that would be a lovely addition to a tea party or to your vintage teacup or tea set. If you love drinking proper loose leaf tea in style this tea strainer is just right! Its very practical to clean and because the whole item is chrome and not silver plate, it does not need regular polishing and doesn't get stained by tea. The mark 'NP Made In England' is stamped underneath the handle. 'NP' probably stands for nickel plate, as in chromium nickel plating. 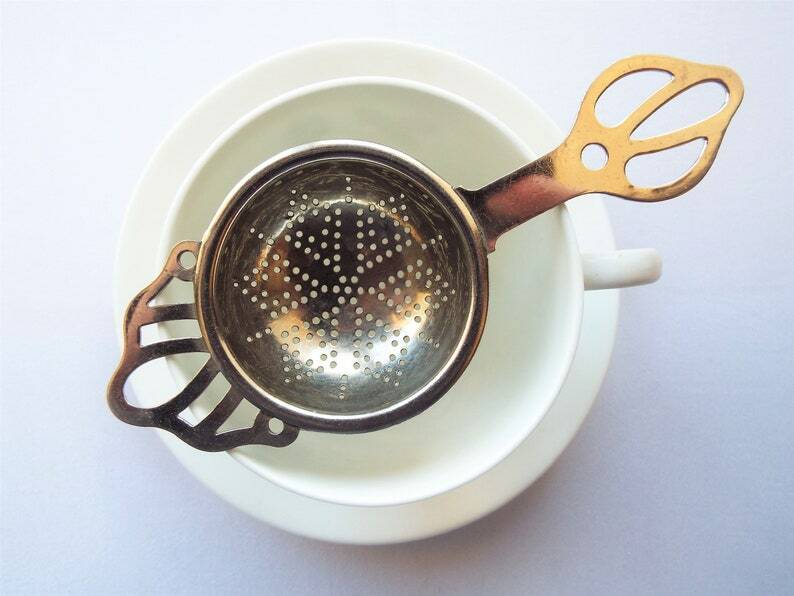 Perfect for everyday tea drinking, this strainer would work especially well with a retro or mid century tea set, teacup or mug. Very good condition. The chrome is still shiny and bright, with very little wear. Any further wear commensurate with age and use. Total length, shoulder tip to handle tip directly opposite 5 3/4 inches (14.6cm) approx. Your tea strainer will arrive carefully packaged, with FREE gift wrapping of vintage style brown paper and ribbon. My standard pretty gift wrapping is available year round.